We can conservatively calculate that the purge of 19% of the Crosscheck lists accounted for at least three GOP Senate victories ”“ and thereby, control of the Senate. Eventually (and legally), we were able to get our hands on 2.1 million of the 6.9 million names””and had them analyzed by the same list experts who advise eBay and American Express. 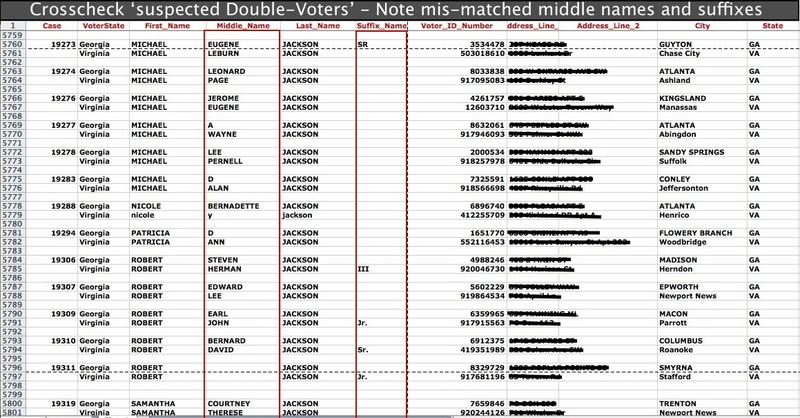 What we found is simply a giant list of common names””a lot of voters named Michael Jackson, David Lee and Juan Rodriguez. The racial smell of it was apparent and awful. As the US Census tells us, African-Americans, Asian-Americans and Hispanics are 67% more likely to share a common name as a white American. In other words, the lists heavily targeted “blue” Americans, Democratic leaning voters. Republican officials have gone to great lengths to cover Crosscheck’s operations. Voters purged are not told they are accused of voting twice. The procedure, created by Kansas’ Republican Secretary of State Kris Kobach, is to send a postcard to each “duplicate” voter requiring them to re-verify their registration. A large percentage are never delivered””Americans, especially renters and lower-income Americans, move often””or cards are tossed away confused for junk mail. The purge of those snared in the Crosscheck dragnet has only just begun. The process of actually removing names from the voter rolls is subtle and slow, involving several steps over many months. Some states mark their voters on the Crosscheck list as “inactive””” which means that, if they failed to vote in this midterm election, they will be blocked from voting in 2016. As a result, Crosscheck will take an even bigger bite out of the 2016 voter rolls. Secretary of State Husted has refused to give us the list of the 469,201 names on Ohio’s Crosscheck list””but we’ve obtained thousands anyway. We found that Ohio’s lists have the same glaring mismatches as we saw in the Virginia, North Carolina and Georgia lists. Please support our continuing investigation into Crosscheck and other election trickery. Make a tax-deductible donation of at least $40 and receive a signed copy of Vultures and Vote Rustlers Palast’s compendium of investigative reports. Or for $50 minimum donation, get a signed copy of Billionaires & Ballot Bandits. Or become a credited Producer ($1,000 min.) or Co-Producer ($500 min.) on our upcoming film based on the book Billionaires & Ballot Bandits. Watch the trailer. You can of course support our work for any amount you can afford, no matter how small or large. we appreciate it all.